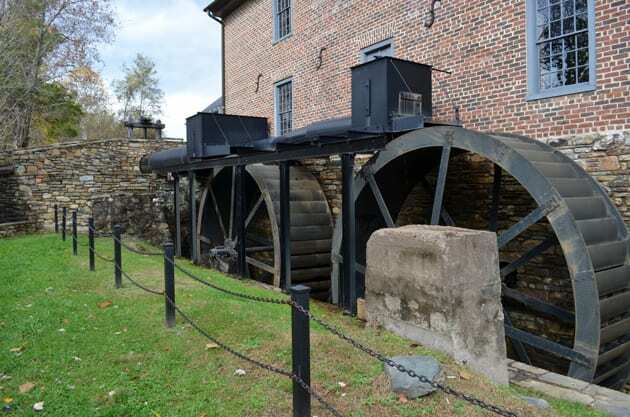 When traveling to Washington DC or visiting Alexandria, one typically immerses themselves in museums and American history, instead, why not escape to Loudoun County for a day or two. If you are a wine lover, consider discovering the wineries of Virginia wine country. Loudoun County is the wine region closest to our country’s national capital. 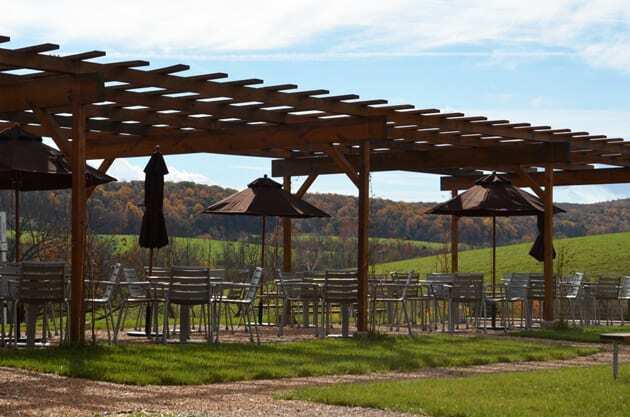 The Loudoun Wine Trail features approximately 43 wineries and tasting rooms. My visit took us to the villages of Aldie and Middleburg and three wineries, Chrysalis, Boxwood, and Greenhill. Loudoun often is called DC Wine Country because of its proximity to the capital, Making winery visits easier for the visitor, Loudoun has broken the region up into wine clusters. Each cluster identifies itself around individual towns that imbue their own character, topography, and terroir to the area. The three wineries I visited reside in the Mosby Cluster. The countryside where these wineries are located is magnificent. The scenery differs from what we typically see in California Wine Country. Southern mansion type homes perched on the rolling Hills welcome you. The area is steeped in American history primarily the American Revolution and the Civil War. Aldie represents the gateway to Loudoun County. Its beginnings date back to 1765 when James and George Mercer established a mill, which is now a historical site. Middleburg was founded in 1787 and by the 1900s became known as the National Horse and Hunt Capital. 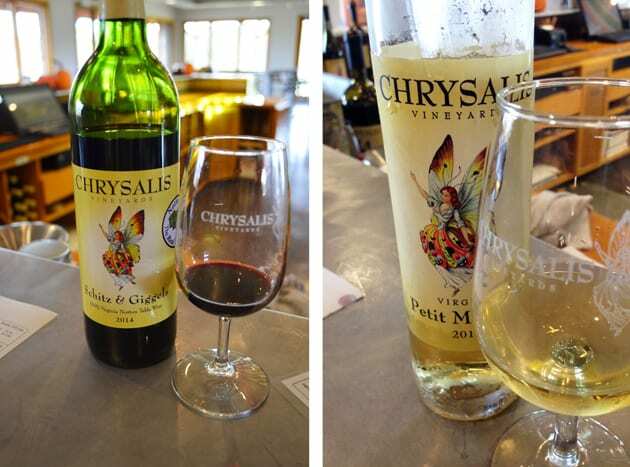 Our Virginia wine country tour began with Chrysalis; owner Jenny McCloud procured a winery concept that more wineries across the nation should incorporate into their facilities. This notion goes along with the farm to table concept of food but includes wine and the winery itself. The idea brings local food directly into the winery by having a bakery and kitchen on premise. Jenny is not a newcomer to bringing fresh ideas to the winery. Her background in technology and advertising comes into play in many aspects of the winery. Her innovation personality was instrumental in bringing Albarino to the US. She also became one of the first to bring cuttings and plant the Albarino grape in her vineyard. Jenny’s real pride is Norton. Her mission; to put this grape on the map, thereby recognizing Norton as Virginia’s grape. The winery currently is one of the largest growers of the Norton. The Norton grape is a Vitis Aestivalis, known as the summer or pigeon grape that is grown mostly in Eastern North America. Considered native to America, the grape was first thought to be cultivated in Richmond Virginia. The winery began in 1998 with 209 acres. Today Chrysalis boasts 412 acres where Jenny also raises dairy cows. The name Chrysalis means the stage of an insect, like the caterpillar before it becomes a butterfly. For Jenny, this represents the transformation grapes goes through from juice to wine barrel to ultimately becoming a bottle of wine. Being a lover of the unique whites, Albarino is one of my favorite white wine varietals. Knowing that Jenny brought this varietal to the United States, intrigued me to sample this wine. Chrysalis Albarino exhibits floral aromas and bright, fresh, crisp citrus and stone fruit flavors on the palate. Mariposa means Butterfly in Spanish and aptly describes the light and fruity character of this wine, almost as if it flutters with the ripe berry flavors. The wine consists of Tannat, Petit Verdot, Nebbiolo, and Norton. Sarah’s Patio Red delivers a light red fragrant yet spritzy wine created from the Norton grape in the style of a Rosé. The wine makes a perfect summer quencher with its flavors of red berries. Chrysalis Tannat is an earthy, tart and smoky wine that displays the intensity that identifies this grape. One wine that caught my fancy was Schitz & Giggels, a playful name for a serious wine. Rumor has it that during Prohibition the Norton grape cease to exist in Virginia but was kept alive in Missouri and today is the official grape of that state. Supposedly two German immigrants living in Missouri, Schitz, and Giggels kept the Norton grape alive in their backyard. Hence Chrysalis Schitz & Giggels pays tribute to them and the Norton grape. Finally, there is the Petite Manseng, a dessert wine that reveals flavors of almond and apricot. Boxwood not only is a winery but a national historic landmark. 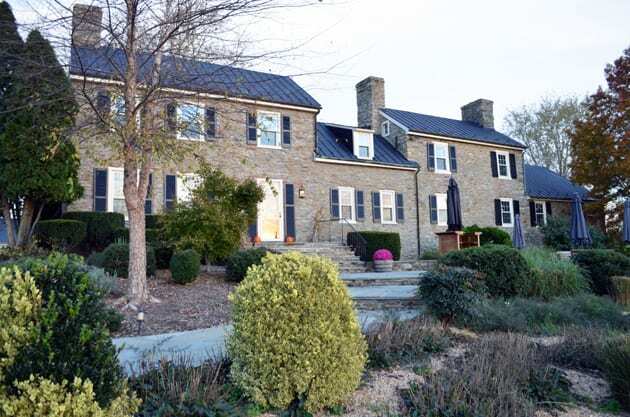 The property, located in Middleburg began as one of the horse farms in the region and later the home of General Billy Mitchell, who was considered the father and pioneer of the air force and military aviation. 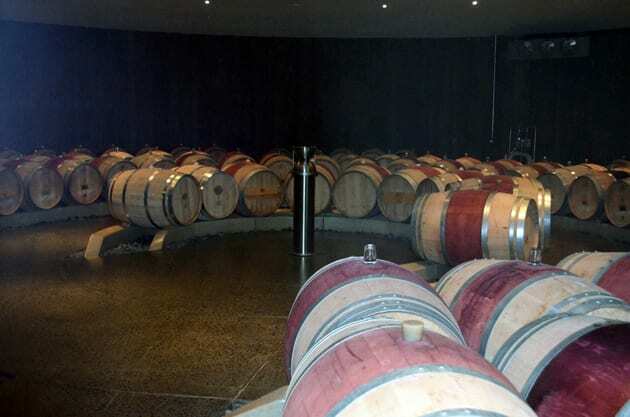 Today, it is an innovative winery owned by John Kent Cooke and his wife, Rita. In 2006, Boxwood released its first vintage. The winery specializes in Bordeaux styled blends. Consulting winemaker Stephane Derenoncort works with Boxwood’s current winemaker to produce the wines. 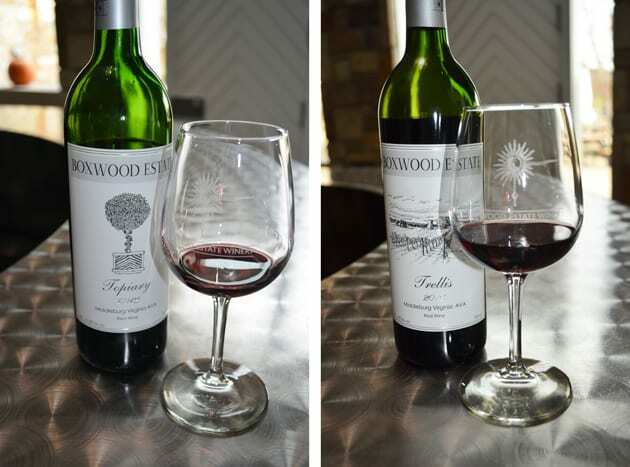 I consider Boxwood a boutique winery with 21 acres of vineyards planted in Cabernet Franc, Cabernet Sauvignon, Merlot, Petit Verdot, Malbec, Sauvignon Blanc and Sauvignon Gris, Nineteen acres are dedicated to the red Bordeaux varietals while the remaining 2 acres consist of Sauvignon Blanc. The vineyards are densely planted, about 2000 vines per acre. The grapes are handpicked. Topiary consists of Cabernet Franc with Merlot and Petite Verdot making this wine more of a left bank blend. Trellis, in my opinion, revealed itself as having more body and complexity. Combining Merlot with Cabernet Sauvignon and Cabernet Franc, I found flavors of plums quite apparent in the wine. Boxwood reserve, a bolder wine that combines the best grapes of the vintage by utilizing Cabernet Franc, Merlot, Cabernet Sauvignon and Petit Verdot. Stepping on the grounds of Greenhill winery one takes a step back in time, especially when you set foot into the Greenhill Manor House, which dates back to 1762. The views are magnificent. I could envision having a wine themed picnic on this estate. Established in 1987, the winery sits on 128 acres. In 2013, satellite communications company owner David Greenhill purchased the property. Sébastien Marquet, a native of Burgundy, is the winemaker. His career includes work in many wine regions of the world including Burgundy, Languedoc-Roussillon, Martinique, Sonoma, and Napa Valley. Besides growing grapes, the estate raises Charolais cattle and pollinating bees, which one can purchase in the winery’s Farm Store. Pretty much everything in the store is local including the home décor and the art. Blanc de Blancs is a very drinkable sparkling wine done in the Champagne method. Find a creamy texture with flavors of green apples and pears. 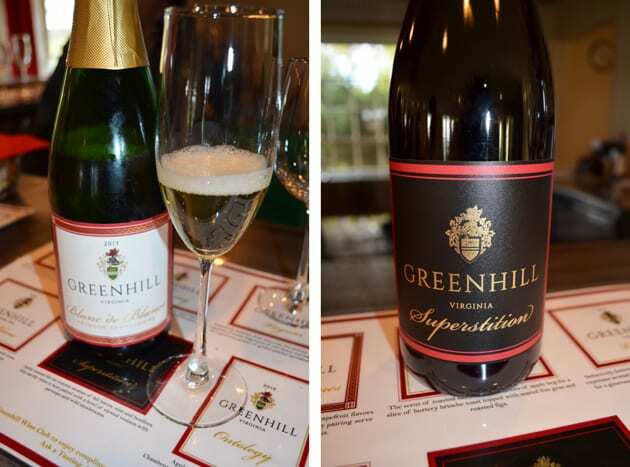 The Chardonnay, created in a Burgundian style was my favorite wine of the day at Greenhill Winery. The flavor of apples abounds in this wine. Superstition, a blend of mostly Tannat with Malbec and Cabernet Franc delivers flavors of sour cherry, dark berries, and green pepper. Ontology features the Chambourcin grape with smoky aromas and flavors. The wine is earthy yet has hints of cherry and bramble. Philosophy represents Greenhill’s version of a left bank Bordeaux wine that utilizes the five Bordeaux grapes. 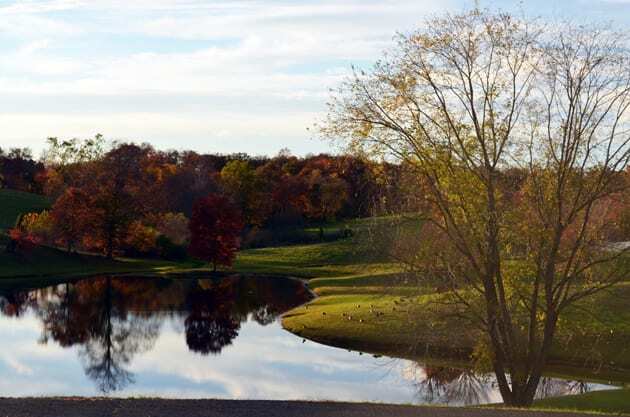 Traveling through Loudoun County evokes a sense of time gone by, agricultural legacies and a heritage that is defined by the country homes, stables and vineyards that populate this Virginia Wine Country region. 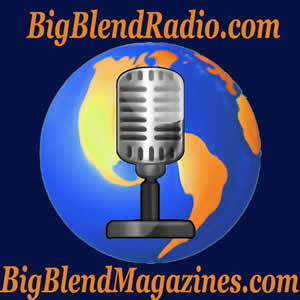 Note: Common to the wine industry, this writer was hosted to the wines sampled in Virginia Wine Country.